As has been the case for the past few months, the distribution of BlackBerry 10 devices has remained unchanged with the percentage of users on OS 10.3.X in the low 90’s. One thing that was different, is that for the first time we have seen a few phones running OS 10.3.3 which is the long promised final update to BlackBerry 10, that includes zero new third party APIs. This data was collected by BlackBerry World for downloads of the free strategy game Pixelated and the free checklist app Stuff I Need. Data shown on the chart is from the beginning of June 2015 through the end of June 2016. For the fifth straight month, the distribution of the BlackBerry 10 operating system has been essentially unchanged. 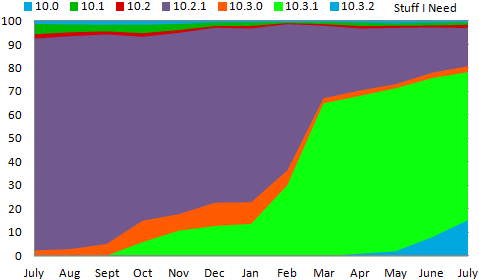 The use of OS 10.3.2 has seemed to have maxed out in the low 80 percent of users. This data was collected by BlackBerry World for downloads of the free strategy game Pixelated and the free checklist app Stuff I Need. Data shown on the chart is from the beginning of May 2015 through the end of May 2016. Use of BlackBerry 10.3.X and 10.3.2 remain the same as they have for the last few months. Despite OS 10.3 being out for a long while now, there are still a decent number of users still running OS 10.2.1 on their devices. This data was collected by BlackBerry World for downloads of the free strategy game Pixelated and the free checklist app Stuff I Need. Data shown on the chart is from the beginning of April 2015 through the end of April 2016. 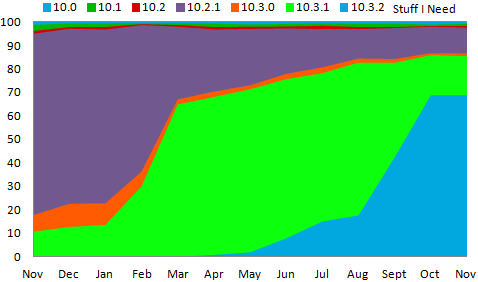 The distribution of BlackBerry 10 OS usage remained flat over the past month. In fact it has been flat for a while with 10.3.0 stuck at 91% and 10.3.2 leveling off a bit below that. This data was collected by BlackBerry World for downloads of the free strategy game Pixelated and the free checklist app Stuff I Need. Data shown on the chart is from the beginning of February 2015 through the end of February 2016. Use of OS 10.3.x was level for both users of Pixelated and Stuff I Need, near 91%. The biggest difference in January was that the use of OS 10.3.2 is up to 76.5% of Pixelated users, and 85.6% of Stuff I Need users. This data was collected by BlackBerry World for downloads of the free strategy game Pixelated and the free checklist app Stuff I Need. Data shown on the chart is from the beginning of January 2015 through the end of January 2016. For users of both Pixelated and Stuff I Need, December saw 91% running BlackBerry 10.3 on their phones. This data was collected by BlackBerry World for downloads of the free strategy game Pixelated and the free checklist app Stuff I Need. Data shown on the chart is from the beginning of December 2014 through the end of December 2015. In the past month, upgrades of BlackBerry 10 operating systems have leveled off. The overall stats for November were remarkably similar to they were in October. 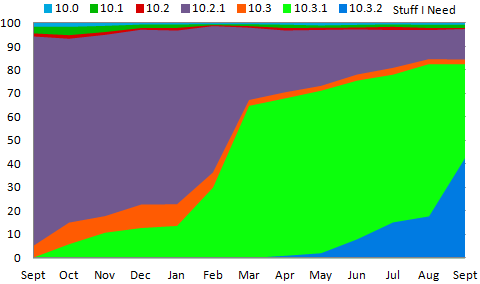 Use of OS 10.3.x has leveled off close to 90% with close to 70% of users running the newest OS of 10.3.2. This data was collected by BlackBerry World for downloads of the free strategy game Pixelated and the free checklist app Stuff I Need. Data shown on the chart is from the beginning of November 2014 through the end of November 2015. 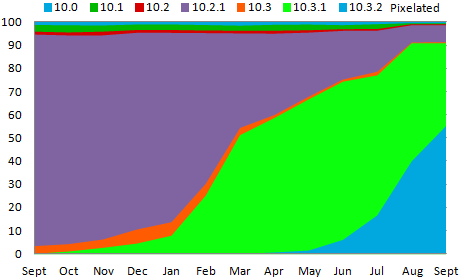 One year after launch, OS 10.3 is on 90% of BlackBerry phones. The roll out of what has been confirmed as BlackBerry’s final OS took some time to get going, but over the past few months, have finally captured the vast majority of BlackBerry 10 users. Additionally the vast majority of users are on 10.3.2, which is currently the newest version of the operating system. This data was collected by BlackBerry World for downloads of the free strategy game Pixelated and the free checklist app Stuff I Need. Data shown on the chart is from the beginning of October 2014 through the end of October 2015. The month of September saw large increases in the use of OS 10.3.2, the newest BlackBerry 10 operating system. However almost all of this increase came from users who were already using a prior version of OS 10.3 as the percentage of users running OS 10.2 and 10.1 remained steady from previous months. This data was collected by BlackBerry World for downloads of the free strategy game Pixelated and the free checklist app Stuff I Need. Data shown on the chart is from the beginning of September 2014 through the end of September 2015. 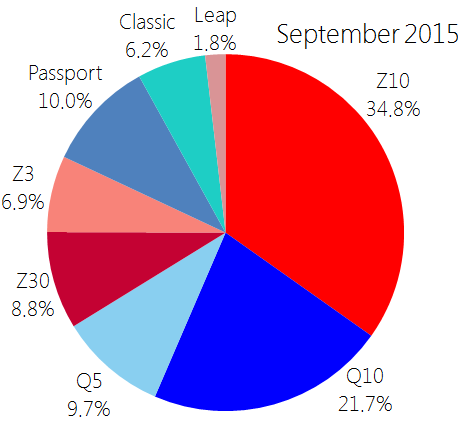 Two and a half years ago when BlackBerry 10 was first released the Z10 and the Q10 were the first two phones released. Today they are still the two most used BlackBerry 10 phones, combining for 56.5% of users. Just under half (47.6%) of BlackBerry 10 users have a physical keyboard on their phones. All of these statistics are based off of the data collected by BlackBerry World in the month of February for downloads of the free check-list app Stuff I Need (which is also available for Windows Phone and Android users). 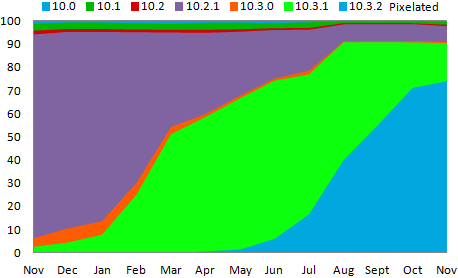 August saw the use of OS 10.3.x (specifically 10.3.2) continue to increase. There was actually a bit of a split in the data for this month as users of Pixelated were much quicker to upgrade than users of Stuff I Need. For Pixelated 91% of users were running OS 10.3 while the number was only 84.6% for Stuff I Need users. This data was collected by BlackBerry World for downloads of the free strategy game Pixelated and the free checklist app Stuff I Need. Data shown on the chart is from the beginning of August 2014 through the end of August 2015. The month of July saw the use of BlackBerry 10.3 continue to slowly climb. Verizon and a few other wireless carrier who had been dragging their heels finally released an OS update, but one out of five users are still on older operating systems. 10.3.2 is not really any different from 10.3.1 and has only been officially released by a few carriers and as a result appears to be getting very little interest from users so far. 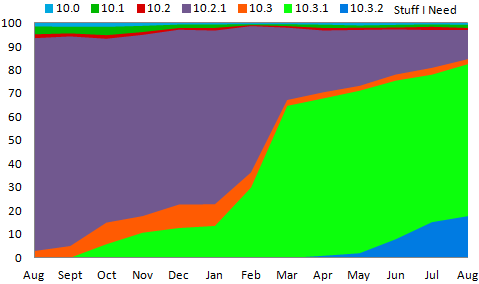 Overall 78.5% of Pixelated users and 80.9% of Stuff I Need users were running some variant of OS 10.3 in July. This data was collected by BlackBerry World for downloads of the free strategy game Pixelated and the free checklist app Stuff I Need. Data shown on the chart is from the beginning of July 2014 through the end of July 2015. 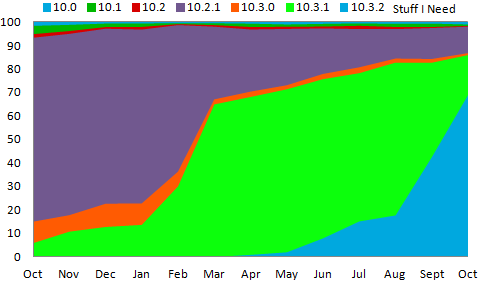 June saw the use of 10.3.x continue to increase. 75.1% of Pixelated users, and 78.1% of Stuff I Need users were running OS 10.3.0 or higher. There continues to be a very small number of users on 10.3.0 with most users on 10.3.1 and a few users on 10.3.2 instead. With Verizon finally rolling out a version of 10.3 to their users in early June, these numbers should be up significantly next month. 10.3.2 currently has very few users and with very few new features it is unclear how many carriers will be pushing out this update to their users. This data was collected by BlackBerry World for downloads of the free strategy game Pixelated and the free checklist app Stuff I Need. Data shown on the chart is from the beginning of June 2014 through the end of June 2015. 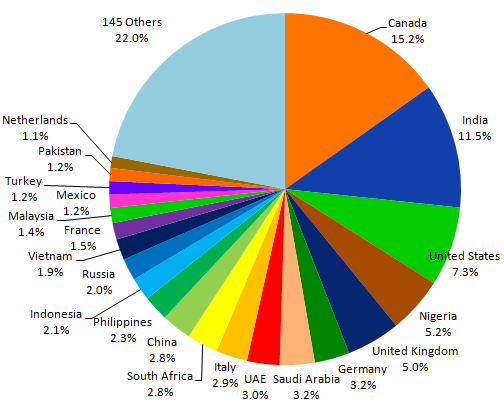 A look at BlackBerry 10 users in 2015, is far more international than in years past. Canada is still has the largest user base, but India and Nigeria have also now moved themselves into the top five. In January 2014 this breakdown looked far different. At that time Canada, the United States, and the UK had combined for 53.8% of the market, but in early 2015 they only consist of 27.4% of the market. Most of the difference comes from a larger share of the market going to countries in Asia and Africa. India has grown from 2.8% to 11.5%, Nigeria has gone from 1.1% to 5.2%, Russia has gone from 1.0% to 2.0%, and China has increased from 1.6% to 2.8%. Meanwhile Canada, the United States, the United Kingdom, and Germany have seen their marketshare drop. The numbers in the UAE, Saudi Arabia, and Indonesia have stayed rather consistent. The end result of this, is that the BlackBerry 10 user base is more geographically diverse than ever. These numbers are generated from downloads of the Stuff I Need checklist app from January 1st to June 9th of 2015. The data was collected by BlackBerry World when the app is downloaded.